Ken Dalebout, Hospital Administrator with 2018 Volunteen Scholarship recipients Chyna Robeson, Samantha Peachey, Cameron Oster and Makenna Stever. 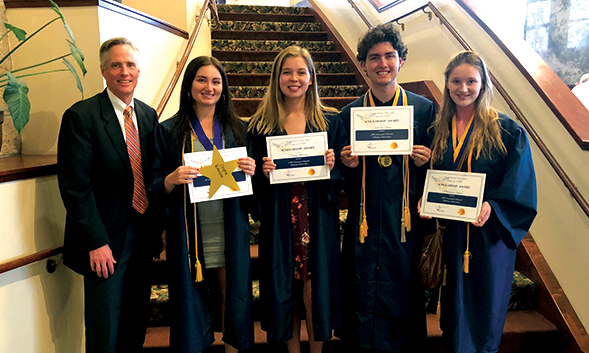 Arroyo Grande Community Hospital Volunteens are exemplary high school students who sacrifice their valuable time during afternoons, evenings, and/or weekends to serve patients in the hospital. There are currently 40 Volunteens at Arroyo Grande Community Hospital that go above and beyond to make patients and visitors as comfortable as possible. As our Volunteens approach their senior year of high school, many apply to colleges and begin making very important life decisions. With the exorbitant price of college tuition and textbooks, today’s graduates need all the help they can get. 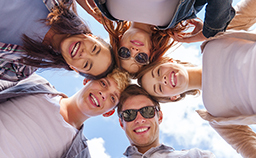 Donations to the Volunteen Scholarship Fund will help provide exceptional Volunteen graduates with scholarships as they begin their journey with higher education. To contribute to the Volunteen Scholarship Fund, please click here or contact us. Looking for a postive way to spend your time?